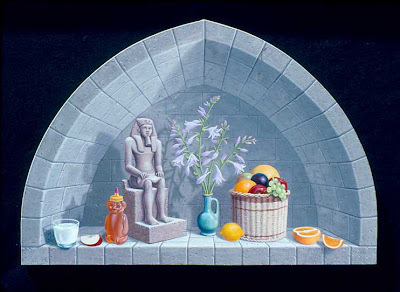 All of the objects were painted from life except the Egyptian statue which was painted from a photo. I remember painting this at Belvoir Terrace where I sometimes did painting demonstrations during class. One student suggested I add the apple slice to symbolize the sweetness of life. Another student was intrigued by my technique of using two colors simultaneously to paint pitted stone texture. "Aha! I knew it was a trick." she said.